Although it may appear solid, the human body is full of moving cells. For example, the mass migration of cells helps shape the human body in the womb. Skin cells crawl towards each other during wound healing and immune cells hunt down infectious invaders. In short, cell movement is fundamental to many aspects of our health and wellbeing. Like humans, all cells move through the use of a skeleton, which in a cell’s case is composed of building blocks made of actin. However, unlike our own rigid frame, cells change their shape and move by constantly collapsing and rebuilding their actin skeletons. Furthermore, in the same way that you could get a good idea about how our skeleton works from looking at the bones of almost any animal, you can understand the actin skeleton of our cells by studying it in any organism. This is because cells laid down the foundations of the actin skeleton and how it works right at the beginning of animal cell evolution and it’s pretty much remained unchanged in all cells since. Indeed, single-celled organisms were using them to hunt and eat microbes long before cells came together to form multi-cellular animals like us. This allowed us to study the actin skeleton in soil-dwelling amoebae, which are far easier to experiment with than humans or other animals. In our study, we took the various molecules required to assemble the actin skeleton, broke them and watched how this affected the movement of amoebae using powerful microscopes. 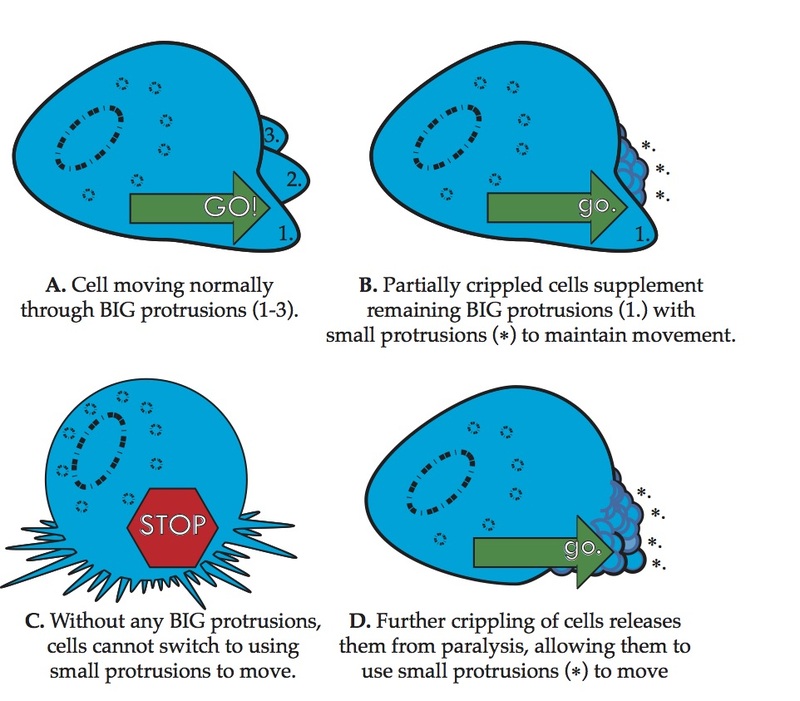 If a human broke their legs, they could still crawl in order to move and cell movement is similarly resilient; it takes a lot to stop cells limping onwards. We set out to force amoebae to switch from one mode of movement to moving entirely by another, the equivalent of restricting a human to crawling. When we only partially crippled one mode of movement, the amoebae used a mix of both modes so as to keep moving. However, when we went further and broke all the molecules required to move in one way (the equivalent of breaking both legs), the amoebae froze up and stopped moving entirely. We tested them in many ways to show that they should have still been capable of moving by alternative means, but simply failed to do so. It was only when we broke one more component of the actin skeleton assembly machinery that the amoebae were released from this paralysis and started moving again (Fig. 1). To understand what is happening here, consider the following analogy: In order to bend our limbs a muscle on one side of the bone relaxes and an opposing muscle tightens. Now in theory there are two ways this could work. The muscles could be rather passive and only tighten when required and if one muscle were damaged the limb could still be bent. Alternatively, both muscles could constantly be tugging and whichever one pulled hardest moved the limb. In this case, if one muscle was damaged the other would no longer be restrained and would tighten and not let up, just as happens during muscle cramp. With our study we have proven it is the latter case that is occurring within the cell’s actin skeleton. Two actin assembly molecules are competing with one another and breaking one simply sends the other into overdrive, fixing the actin skeleton rigid and paralysing the cell. Only after the second assembly molecule is removed is the cell freed to adopt alternative means of movement. Thus, cell movement is only possible when a balance is struck between the competing actin assemble molecules.